Now is the time to check colonies to make sure they are dead or alive. All this next week the daytime temperatures are in the 40's. It is warm enough for a quick check. A quick check should reveal ample honey stores and at least four frames of bees. Colonies that are weak could possibly be in the need of a package of bees to get them up to strength for the summer nectar flow. Waiting to long before checking colonies may make getting package bees to replace deadouts hard to get as package bee suppliers sell out their loads. Bee Vs. Car: Who Gets More Miles Per Gallon? An interesting comparison that may surprise even a beekeeper. I have heard many reports of bees wintering in good shape. 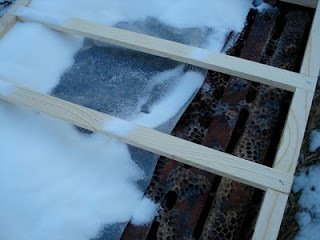 The weather this winter has not been bad for bee survival. As long as the winter chill of several days of sub zero temperatures stays away, I expect the colonies that have adequate food stores, young queens, and have low mite levels to make it. 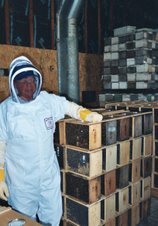 Some of the beekeepers that have had some losses either did not treat for mites or treated to late. The queen in the colony has been through one winter already and is going into a third season, she is considered to old for the rigors of winter survival. Checking for mite load in early September and getting good numbers is great but consider this. Feeding the hive syrup by not starting until late Sept, and feeding until mid to late October can lead to problems. Late feeding increases the mite load of a colony due to increased brood production brought on by this feeding nectar flow. Late feeding keeps brood in the colony too late and causes the hive to deplete winter stores with the bees keeping the brood warm. Late October feeding keeps brood in the colony until late Nov. and possibly early Dec. The thing I remember in beekeeping is using the calender to dictate hive management helps to do things at the right time. Pulling honey by mid August helps to move the fall management to a better schedule for the bees. Pull the honey and feed then. Get the feeding done early. This will keep the late mite load down. I want the hive to shut down brood rearing as early as possible. Treat for Varroa if needed, as soon as possible. No later than the first of Sept. A week earlier if possible. Requeen regularly, by requeening every year in May greatly increases the odds of winter survival and cuts swarming in June to a lower level. Example: If a beekeeper has four colonies and requeens them in the spring. The cost is around $80 - $90 dollars. If swarming is managed four hives they may yield 480 lbs of honey, 12o lbs each, lets say. Each colony that swarms loses the nectar flow for the year. Over $200 dollars per colony in lost income. Now if a beekeepers has had one swarm and two colonies die in the winter and has to be replaced with a package. That is $120 for new packages, for a total of $320 dollars. Now the new queens look pretty cheap. This is the economics of farming. I have noticed an early sign of spring this past week. In late winter the branches of the Willow tree turn a noticeable yellow in color. Driving around they are easy to spot and stand out from the gray bark of all the other trees. There is an end in sight to the cold tundra that we currently living in. FYI - my first load of bees is more than half full. I went to my bee yard that I was planning a total redo this spring. New boxes and frames. I did not cover them with winter wraps. Many were weak in the fall. I left food on the one and it made it in spite of a winter cover. While I covered most of my others and many are still alive this does prove that bees are tough creatures as long as they have food and are as mite free as possible. I thought it was a good way to illustrate how easy it is to check for food and hive strength. You can see in the video, a quick check and I saw 6 frames of capped honey in the super and at least four frames of bees. Even on a 20 degree day a quick peek is ok. The hive wasn't open more than 15 seconds. I knew what I was looking for, so that cut the open time to very little. The hive looked good and I am fairly confident they will make it, barring any extended cold weather or queen problem. If I had food issues I could have put on a candy board or some granulated sugar as described in an earlier post. Unfortunately, this customer will not be getting a credit for the damaged cage. I don't cover the frames or the bees can't get to it. I cover the hive and put the covers back on. The entrance hole on my black box has to be elongated because the 1x2 shim raised the roof an 1-1/2"
Feb is the worst time of the winter season for hive survival. This is the time of year that old man winter can kill large amounts of bee colonies across the midwest. Starting anytime soon the queen is going to start laying eggs. The bees will keep the area around the brood about 96 degrees. They will start to hit the honey stores when the brood rearing starts. To maintain the warmer brood temperature the honey consumption will rise dramatically. In Dec and Jan a hive consumes about 12 - 14 lbs of honey per month. Now with the coming of the brood, the shift in honey consumption will be in the 15 - 20 lb per month range. The honey consumption starts slow in Feb but gets to the higher level in March. As the bees feed the brood, they can deplete all the honey stores in the immediate area of the brood. The bees will have to bring honey in from the nearest source. If it is a full frame adjoining the brood cluster there is usually not a problem. However, if the brood was started in an area that has been depleted of stores, the bees may have to get honey from two to three frames away. Remember it takes 21 days from egg to emerging bee. That is three weeks the brood is in that same location, The honey can disappear quickly. A deep frame full of honey weighs about 9 lbs. When the temperature stays in the 20's during the day this is normally not a problem. This morning in Stillwater the low temp was a minus 8 degrees F. But it is going to get into the 20's. Great weather. 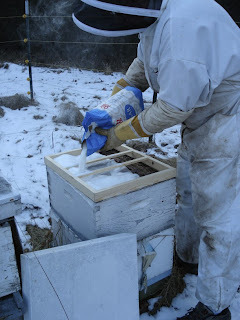 Moderating temperatures of single digits at night but 20's during the day pose little danger for hive mortality. It can happen, but usually the bees do well. For Feb colonies, the danger comes if there is a cold snap of 3 days or more. If the nights get subzero and the daytime highs are single digits there will be widespread colony starvation. The starvation will come from the depleted stores around the brood. The cold causes the brood to form a tighter cluster to maintain heat for the brood. The tighter cluster is now off the honey stores that were being used to feed the brood and maintain heat. The hive will perish trying to keep the brood alive, even though a full frame of honey is sitting two inches away. When you open a dead colony in late winter and see 4 or 5 frames full of honey but dead bees. The first thought is mites, CCD or some other bee malady. Pulling the frames where the cluster has died and looking at the frames. If the bees have their bodies stuck into the cells with their butts looking at you is the sign of starvation. After this gloomy picture I painted what can a beekeeper do? Really not much. Feeding syrup this time of year makes the problem worse. The bees think a nectar flow is on and the queen starts laying more. 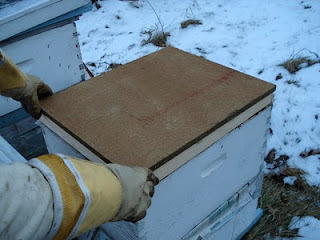 Putting granulated sugar or a candy board on top of the colony can help. If the weather gets into the thirty's a colony can be opened and a quick peek looking for capped honey near the cluster. If no capped honey is seen, a full frame could be bought over and placed near the cluster but not into the cluster. Disruption of the cluster may cause an accident of killing the queen. 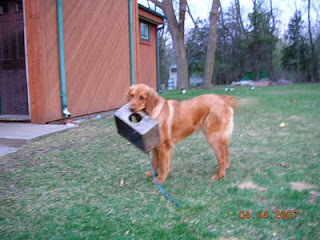 In most cases letting the bees fend for themselves is usually the best plan. Check a colony after a cold snap to see if they made it.